This is the first of a number of tutorials for my app External Keyboard Helper. This tutorial will help you doing a basic setup to get you started. There is a free demo version. Try that first if you have the slightest doubt that this is the app for you. If your keyboard isn't working att all with your device in the first place, then my app will not help you. Assuming you have bought the app (or installed the free demo version) the first thing you likely do is to try start the app with the app icon. Input methods needs to be enabled and the app will detect that it is not enabled and launch the settings for you so that you can enable it. Now you need to check the little checkbox to enable the new input method. 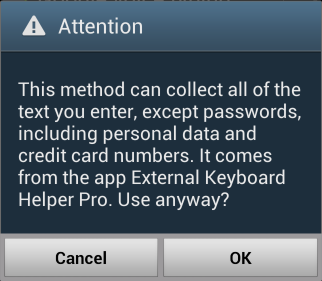 Android will throw up a warning about using user installed input methods, this is standard procedure to remind you that ANY input method is potentially a keylogger. You will get the same warning if you install and enable popular soft keyboards. This is a legit warning and is the very reason why I warned about using pirated and resigned input methods. That being done, let's enter the settings and see what we can find. The first time you enter the settings it will read your language and locale settings and try to autodetect which layout you might want to use. Since I've configured my phone to English (United States) when making the screenshots it autodetected English (US) layout. However, since I live in Sweden and my keyboard has a Swedish layout I am not satisfied with the automatic detection and instead manually selects the Swedish layout. Lastly for External Keyboard Helper to do anything it needs to be selected as the active input method. There are several ways to select the active input method and the method is different between Android 2.x and Android 3.x/4.x. However one way to do it is to start the app icon for External Keyboard Helper (again). This time, when External Keyboard Helper has been enabled, it will ask you what you want the app icon to do. For this example I choose Show Input Method selector (you can change this later if you want) and it will present the Input Method selection dialog. I choose External Keyboard Helper Pro as the new active Input Method. Whenever I want the virtual keyboard back I can repeat this procedure and change it back. By default it will also show this dialog whenever a Bluetooth keyboard is connected or disconnected. So now I have enabled the External Keyboard Helper input method and configured it to use the Swedish layout. Then I selected the External Keyboard Helper to be the active input method and now or setup is complete and I can start using my external keyboard. This is the end of tutorial 1 and in the next tutorial we will remap a couple of keys that does not work right with the predefined layout on my Targus iPad keyboard. Hi, how can I do to enable this app while using Google Pinyin input method, so that I can type Chinese Characters. Really love this app. Sorry, but you cannot. Two input methods cannot be both active at the same time and Chinese is currently not supported by my app. Hi. I am still stuck! I have a Lenova A2107 tablet and purchased an external keyboard, which when purchased, said it was compatible. But I cannot get it to work! I have been looking for hours over the internet on how. I have downloaded your app, but to no avail. I have followed the above up until the last two steps, as I am not sure if I have done it correctly. I got to "launch settings" but that option does not come up. I have ticked the box "external keyboard help" and unticked the other boxes, is this correct? However, I have concerns about "rooting" my tablet and the security risks. I am annoyed that the external keyboard has been sold to me without any instructions or with any warning on the sellers page that I may need to do a million and one things before I can use the thing. I don't know if you can help me, as I have ran out of ideas and the forums haven't really helped. My app can only help with the layout if the keyboard works in the first place. I did a quick search on Google and it seems people have problem with both USB and Bluetooth keyboards on this tablet. Usually Bluetooth keyboards (and mice) works with Android 3.0 or later both sometimes there are exceptions. USB keyboards support also varies between manufacturer but you almost always need a special USB OTG adapter to activate the USB Host mode (if supported by the device). Thanks for the swift reply, much appreciated. I have a USB OTG which came with the keyboard, so I can plug it in (it's a mini usb). (Unless there is a special one I need to get). I've had a look on the link you've show, and it certainly does seem I'm not the only one with this problem! I find it bizarre that Lenova have done this! Plus I'm annoyed as when I searched on Ebay, this specifically said it was for the Lenova model! Needless to say, I have contacted the seller. I used the demo version. I was very happy to find out that Greek accents are included properly. However, I fail to find out how I switch languages. I need to type both english and greek in the very same sentence or text. 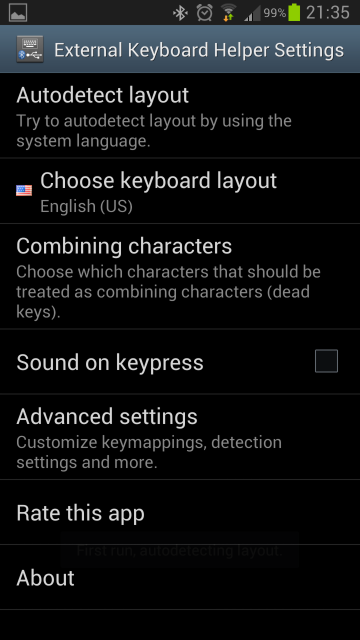 In the advanced settings you can select a key (or key-combination) to be used as language switch key. You can select up to 3 different layouts and toggle between them using your language switch key. Info on the android os is 4.`.1. I am ok with the combination to switch the language. But while on ASUS keybpoard setting the language switches (Ctrl+Space, Shift+Space) when I have put the "external keyboard helper" as Default keyboard and input method receive a text "_this is demo version" but the language does not switch. Is the feature unlocked with the full version? I just the checked source code and yes the space-blocking-code in the demo version also blocks the language switching. In the Pro version this will work. Your only option with the demo version is to dedicate a separate key to language switching. I have a Lenovo A107 and had the same issue. If the tablet you have runs v2.x of Android it does not support HID (i.e. keyboards and mice). I found a package that will make it work. About 90% of my apps work with it. I hope this helper will fill in the gaps. We'll soon see. The package I have is called BlueKeyboard JP. While it is a Japanese version it works for English as well. Just search for it. Does it work on Android netbook (no tablets with external keyboard but netbook)? Likely yes. Try the free demo version to make sure. You may need to disable the "Device ID filter" in the advanced settings to make it work. pra que serve o NULL INPUT METHOD ? Hi, maybe you do not remember me but we talked some time ago because on my Samsung Note 10.1(N800) with Android 4.1.2, every time I turned off the screen at the next operation I returned the Samsung default keyboard. You helped me a lot but I want to know if there is news because the problem was never resolved. Samsung does many great devices, sadly they also modify Android from it's original form a bit to much for my taste as described in tutorial 6 they do all they can to make sure you use their own input method with external keyboards without any option to turn it off. As you can see from the comments on tutorial 6 they only real permanent (and a bit risky) option is to root and disable the Samsung keyboard completely. If you set the app icon to Show Input Method selector and later wish to change Settings, how do you get there? Just go into the "normal" Android settings and find the "Language and input" (or something similar) settings. Find External Keyboard Helper and enter it's settings. In the advanced settings you can also change the icon behavior to "Start settings" if you want to. Got it, thank you. Just one follow-up: If the icon behavior is set to Start settings, how can you easily change the Input Method? As your very nice tutorial above says, "There are several ways to select the active input method...." On my Android 2.3 system, it appears the only way to do that would be to go into Settings, Language and Input, and start checking/unchecking boxes. To make this all more convenient, I might suggest that on your Show Input Method selector you also just include a button for Settings (and you could have a setting to control whether or not that is shown for those who don't want it). That way it's easy to change input methods, but if one wants to go to Settings, it's fast and easy and there's no need to drill down in a system Settings menu. Would save a lot of time when doing/testing a fully custom setup. Nice app! Sadly I have no control of the Input Method selector. It's a standard part of the Android operating system. The point of using it is because user installed apps are not allowed to change the active input method so the best I can do is to bring up the built in selector. I'd suggest that you configure the icon to bring you into the settings and use the long-press method to switch input methods. 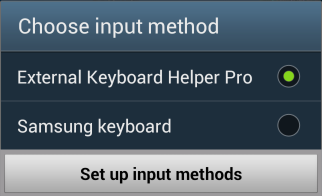 In Android 2.3 (and earlier) you can long press in any input area and bring up the input method selector. The external, bluetooth,keyboard is properly paired and I Enter English text without a problem. In fact, I am writing this post using this very same keyboard driven by "External Keyboard Helper Pro!" The problem I do have though is that I am unable activate the Hebrew keyboard layout. In "Settings" all parameters indicate "Hebrew" but no Hebrew can be typed. I can see Hebrew text, e.g. from Israeli Internet pages or downloaded Hebrew documents. Is there any way to make it select the default imput as the keyboard helper whenever a Bluetooth keyboard is connected? I'm having to switch it every time I connect, when I disconnect it reverts back to the Samsung keyboard as the default and doesn't revert to the helper upon reconnecting the Bluetooth. Like a way to set a default for when the Bluetooth is connected and a separate default for when it's not? No, sorry, I think this is mentioned in the FAQ also. For security reasons no user app can automatically switch input method. However, on rooted devices some people have successfully been able to set up the app Tasker to do it. I have successfully paired an external bluetooth keyboard with my Arc smartphone (used the ex. keyboard to input the pairing code) and installed your app and selected it as the input method as described above. But I still can't get the keyboard to actually input any text on my phone. What could be wrong? As mentioned in the FAQ the phone (or tablet) must work with a bluetooth keyboard for my app to be useful. Make app doesn't add bluetooth keyboard support but if the phone (or tablet) supports bluetooth keyboards then my app can help getting the correct keyboard layout. Some devices can pair with bluetooth keyboards but still doesn't support typing with bluetooth keyboards. What Android version does your phone use? Often newer Android versions have better built in support for Bluetooth keyboards. Because I input the pairing code using the bluetooth keyboard I thought that meant my phone supported typing with a bluetooth keyboard. Sorry if I misunderstood. Hello! I have a question regarding this app. I have a Galaxy III updated to the latest Android version, and I use ShareKM app to control the phone from my computer through a USB connection. The problem is I can't use it in my native language (spanish), since the keyboard will be configured with the US English layout. I was hoping this app could solve my problems, but I installed it, followed all the instructions, and I find myself with the persisting problem. Are the apps incompatible? Am I doing something wrong? Cheers! I checked ShareKM out and it sends scancode 0 on all keyevents which is why my app cannot do any remapping. I actually tried to add some code as a workaround to convert keycodes back to scancodes but it even seems ShareKM has several keys mapped wrongly even with the US layout so I decided to drop it. I looks like it is no longer developed. If the developer of ShareKM makes includes scancodes in the keyevent it generates then it should work out of the box with my app. A little update on this. ShareKM does not send the wrong keycodes if I configure my windows machine with an English(US) layout. However if I configure my windows computer with Swedish layout then some keys are mapped really strange. So what I've done for the next version is that I've added a checkbox in the advanced settings that enables a workaround for ShareKM but you may need to switch your computer to English(US) layout to make it work correctly. Luckily in Windows you can set keyboard layouts different for different apps so you can set the English(US) layout only for the ShareKM application. apedroid, you are a star! Thank you so much for the update, which works quite well. I couldn't find the per-app layout settings in Windows 7, but managed to work out that if you turn on the language bar, and set it to "auto adjust", then it remembers to switch to US layout when you activate ShareKM (after setting it manually the first time). I now have the £ ' @ " symbols in the right places for a UK layout. 2. I can't get a \ or | symbol to appear at all (possibly because this key, next to left shift on UK layout) does not exist on US layout?). Pressing the key returns nothing at all. I tried to remap it in advanced settings, but ran into the problem with every key returning a 0 scancode, so I can't figure out which scancode to use. But the key in question does at least trigger this 0, so it's not that there is no signal being sent. Any suggestions? Follow-up: I just found the "Combining characters" setting, which allowed be to solve my first issue above. I didn't know this setting was there, but I have little need for accented characters, so I can turn all the combining characters off. As a workaround for the second issue, I have remapped ¬ to \, which allows me to produce this character, but I need to remember to use a different key, which is what I was trying to avoid in the first place! Fortunately, \ is used much less than the symbols I was having problems with before, so I'm still in a much better place. Sadly ShareKM doesn't send a scancode or a keycode for the extra key that US keyboards do not have (usually placed to the right of the left shift button) so I can't help with that. There is no event generated at all when that key is pressed. Ah yes, you are right. I still had windows set to UK when I was trying to remap it before. Oh well, thanks for looking into it. I have the same question as Lucas above. The ShareKM app only seems to allow US keyboard layout. As a UK user, this means my " £ ' @ symbols are in the wrong places. I was hoping external keyboard helper would be a solution to this, but unfortunately, it doesn't seem to intercept the keyboard commands that ShareKM provides. If there is a way to make it work (or you can add this functionality), I would be purchasing the Pro version immediately! I may give it another go. Still, the best solution would be if ShareKM got updated to send scancodes as well as keycodes. Workaround will be included in the next version (se answer above for more details). Hello, I have bought the pro version but I can't work out how to use this app. Very simply, I have a Nexus 10 and a Motorola wireless keyboard. Some keys such as £ " and @ don't work properly. I want the keyboard to work for UK English, how do I do this? I can't find any helpful documentation. This tutorial should be enough to get started. I have a Nexus 10 myself so I'll know for sure that the app will work fine with it. Likely my app is still not setup as the currently active input method or maybe you have not yet gone into the apps settings to select the English UK layout? Please review the tutorial again. If in doubt if my app is active then temporarily configure it for a really different layout, like for example Korean, then you'll know for certain when it is active. For the prompt: What do you want the app icon to do (you can change this later in the advanced settings)? If I choose "Show Input Method selector", how do I ever get to the settings again? The only way I can find is to clear the app data, which is quite undesirable. You can always enter the settings the way you normally enter the settings for an input method. 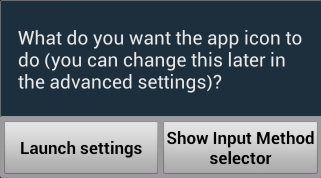 In the standard android settings for your device look for "Language & input" (or similar). In the advanced settings menu for External Keyboard Helper you can find a settings to change behavior for the app icon. I am looking for an app that will allow me to use a soft keyboard and a USB connected keyboard emulation device at the same time. In other words I don't want to have the soft keyboard disabled when I plug in a USB credit card reader that my tablet thinks is a keyboard. let me know if your app will solve the problem. Sorry my app doesn't have a soft keyboard and only one input method can be active so when my app is active you will always lose the soft keyboard until you switch back to your previous input method. If I may ask: I own a Lenovo IdeaTab A1000, along with a no-name external keyboard. The keyboard works OK when connected, but there is no way to switch to any other layout except for the standard English one. I need to use Greek keyboard layout; I contacted the Lenovo helpdesk and they told me there is a compatibility issue and that there is no external keyboard they could recommend that would work properly in Greek (!). Will your app do the job? If yes, I would be happy to buy it. Most likely my app will help you. If unsure, try the free demo version first to make sure it works as expected. Hello I have I logitech k400 with Swedish keyboard layout buy cant get åäö to work! I have tried to manually map the keys with scan codes but it doesn't work. I have pro version. Please help! You should not need to manually map anything. The predefined Swedish layout should work fine with the K400 (I have one myself). Make sure EKHP is the currently active input method. Also if everything else fails, disable the device ID filter in the advanced settings. I"ve purchased a pro version. Still cannot define more than one language layout. What should I do.? I chose "show input method selector", and now I can't go back to settings. What do I do? You can always enter the settings the way you do it for all input methods. Just go to the android settings and find the language and input settings where you should find all your installed input methods and their settings. Once there you can change the behavior of the app icon in the advanced settings. I have a Galaxy Tab S 8.4 WiFi. I live in the UK and want to use a UK layout Bluetooth keyboard. But before I buy my own keyboard, I have been trying to make sure that I can get a keyboard working correctly on my tablet. I can plug in a keyboard via USB and I have occasional access to a bluetooth keyboard that I've also been trying. So far, connection-wise there's not a problem. The tablet recognises the keyboards and the keyboards are totally useable. I can type stuff and the android keys trigger corresponding functions on the tablet. Lovely. Except, it believes these keyboards to be US layout keyboard, not UK layout. So enter stage left, EKH Pro. I installed it, checked it had selected the correct keyboard and tested it. No effect; the keyboard still behaves like a US keyboard. So I go through tutorial 1. No effect. I go into EKH's advanced functions into the testing and debugging mode. It definitely registers the keystrokes. I then spotted tutorial 6 specially for Samsungs. I tried going though that, but there is no little dialog box thrown up by the Samsung, so the delay introduced no benefit. So I rooted the tablet, installed Titanium Backup Pro and froze the Samsung Keyboard process. Still no effect. I uninstalled EKH, cleared the Davlik cache, restarted the tablet, reinstalled EKH and tried again. No effect. It's like EKH just isn't there. If you have any suggestions or if anyone has any expeience of getting this working on a Galaxy Tab S please reply here. Update: It works. But not because of anything I've done. I suspect it's always worked. I think it even works without freezing Samsung's Keyboard. The problem was that I was using Google Docs as a scratchpad to test the keyboard mapping. But I've discovered quite by accident that the EKH works elsewhere. Everywhere, in fact, except in Google Docs. For instance it works in Google Sheet, Catch Notes, typing in WiFi passwords etc etc. I haven't investigated why Google Docs ignores the mappings yet. There are no settings in Docs relating to the keyboard. If I had to guess, I'd say Google Docs reads directly from the hardware for some reason and thus bypasses any managing software that may be there. Go figure. If I can't find fix Google Docs, I may have to find a different software suite from elsewhere. Microsoft are supposed to be producing a version of Office for tablets anytime soon. That ought to be good. Anyway, bottom line is, EKH Pro works with the Tab-S ... providing you're not trying to use Google Docs. I have a problem with my USB keyboard. It has no apostrophe ( ' ) related to any command on the keyboard. With your app, I was able to switch a mismatched letter, but I can't find how to «create» a new type of command. I have a LG g pad 8.0 and the app works with my device but at some point there randomly shows up a text (DEMO VERSION!) when did literally nothing. (I just typed in something). What can I do against this because this is really annoying when I want to write for half an hour. Hello from Kansas City - USA! I am a lover of all Samsung devices (android tablets, windows tablets and smartphones). I've used your External Keyboard Helper Pro application for years, hands down, it's IMO the best. THANK YOU. I need help with settings for my Samsung Galaxy Note Pro 12.2 (running stock, non-customer, ROM). I've had your app installed on the device since day 1, and never had a problem. I'm using the Samsung Galaxy Note Pro with the Logitech Bluetooth keyboard-case, to stream videos using Google Chromes's browser. Using the Logitech Bluetooth Keyboard, I'm trying to emulate the F11 key to access 'FULL SCREEN' mode, but it is not working. I've tried the recommended key combinations, and also test many other key combinations in an effort to achieve Full Screen viewing. I've checked, doubled checked my setting, but can't seem to find the solutions. Can you help? Are there any settings, especially any tweaks or known problems, when working with the Samsung Galaxy Note Pro12.2, the Logitech Bluetooth Keyboard/case, and Your application? Any help is greatly appreciated. God bless and THANKs again for your years of support for such a wonderful & necessary application! Kudo's to External Keyboard Helper Pro and your development work! Can I use this for Tablet Samsung Galaxy Tab 3, Model SM-T210? I downloaded the demo in order to remap a couple of keys on the Rii 8+ mini keyboard. The app doesn't pick up the keyboard at all. It is attached to the Nvidia Shield TV via micro-usb but all it picked up was the Android Leanback Launcher which is part of the software installed in the Shield by default. Thinking it might be because it's just the demo version, I downloaded the Pro, but still no go - it still will not see the Rii. I manage to get the 5 buttons working, but I can't use the Potentiometer in the middle, I don't get any KeyCode nor Anything when I scan it. Thks for developping such a convenient app. I am using a USB keyboard with a French Layout (with an Android Mashmallow Device). I am writing texts both in English and French. i would like not to change physical keyboard each time I switch language, but I would like to be able the "dictionnary" used to allow for using either English or French dictionnary. i am sure this is easy but I have no idea how to do that. Hello. Is this blogg currently monitored? I bought this app and it works pretty well. However, unlike the demo version, the complete one seems to miss the first caracter on some words from time to time, which makes it really hard to type efficiently. The problem occurs only with Word also, which is weird. Anyone to help me figure this out? Before I buy this app, would it enable "CAPS LOCK" notification and/or key light?? Battery status? Repeat rate or backlight settings? I'm using an LG Stylo 2, Nougat 7.0, with a Logitech K810 Bluetooth keyboard. Trying to replicate some "Setpoint" Windows features that Logitech neglected to provide for Android. The keyboard works fine for the basics right now, but I would like to unlock what it should have come with. Customizing and remapping whatever else I can do will come later. I intend to use the External Keyboard Helper Pro for a rather untypical purpose: I’ve developed a control layout (buttons and rotary encoders) for a touch-only automotive infotainment (music + radio + navigation) unit which is actually (and conveniently) a mini USB „keyboard” with just 10 buttons (Mute, Navigation, Home, Back, etc.). For this reason I need something for remapping keys and start applications by clicking buttons etc. As I can use neither Tasker nor Automate due to security reasons (the unit doesn’t let modify the accessibility settings which are essentially for such scripting and automation programs to access the keyboard) my only hope is your application. As I can see your application lets me remap keys, start applications etc., that is, fits almost perfectly what I need. I have one single problem though. As this „fake” keyboard cannot replace a real one (it has just 10 keys) I still need the on-screen keyboard, but External Keyboard Helper disables it, more specifically it replaces with a Null Input method invisible soft keyboard. That is, a plain text cannot be entered anymore, e.g. a GPS address or a web site location. So, my requirement would be to put a setting somewhere which optionally can re-enable the soft keyboard aside with the hardware one. In this case the hard and soft keyboards would work side by side: the physical „fake” keyboard would control the unit while the soft keyboard would appear when necessary for typing plain text (as you can see on the regular use of an Android unit). If this setting already existed or there was already a workaround for this I would be really satisfied but as I can see this problem cannot be solved using the current External Keyboard Helper Pro. Do you think this feature can be implemented easily as a matter of just a couple of weeks? I f so, I would be extremely happy! I have an AnkerA7726 Ultra Compact bt keyboard. Your app works for the most part, but the one character that I need most in typing French characters is the accent aigue doesn't work--that's the only one. I asked Anker for the scan code for the " ' " character, to which tech support replied that there were no scan codes, that it was not a configurable keyboard. Yet everything else in your app works as advertised. Any suggestions?